For many years Shearwater have provided a wide and varied portfolio of international services for the shipping industry. This has grown from our experience providing services for the Royal Navy’s submarine squadrons and surface fleet and the provision of emergency support around for various shipping companies and agencies. One notable contracts in recent times was the hull clean and propellor polish of eight Maersk Baltimore class container vessels, following a prolonged layup period in Loch Striven, Argyll. This single project required three dive teams working simultaneously and was completed well within the specified time-frame and to the clients full satisfaction. The company has fine tuned this particular service over the years by utilising their vast experience in technique and ensuring the procurement of highly specialised cleaning equipment that is capable of removing marine growth without damage to protective paint coatings. Recently the company was awarded a three year contract by Scottish Ferry operator Caledonian MacBrayne to provide 24/7 emergency support for the company’s fleet of vessels. 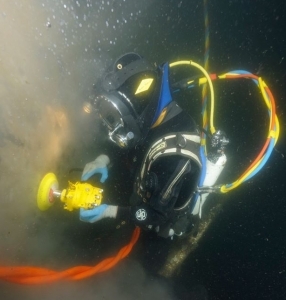 An overview of Shearwater’s capabilities includes, but is not restricted to: Inspections to Lloyds/DNV standards; hull thickness measurements; underwater welding repairs; underwater burning and demolition; vessel recovery and salvaging; Hull cleaning; propulsion units – cleaning and polishing; blank design, manufacturing and installation; procedure writing; trial fits; safety assessments; voith Schneider replacement; towed array removal and retrofit; bellow removal and replacement; sonar removal and replacement; specialised valve removal and replacement; high definition video and photographic surveys; steel thickness and corrosion potential inspections.